Miami art week part 2: Of the three fairs I was able to attend (ABMB, UNTITLED, NADA), very little screen-based work was on display (haha). I have no data to substantiate this, but I believe that presentations of media art at Miami peaked several years ago and have declined since. Even at the peak, much on view was video or generative digital work added to an otherwise conservative booth to signal “contemporary!” to anyone motoring by. A few galleries besides yours truly (Aspect/Ratio, Cherry & Martin in 2014 and 2016 come to mind) reliably present challenging work in a way that doesn’t feel narrow or genre-ish. But on balance, given my predilections, I would have enjoyed seeing more moving image work and more thoughtful engagement of tech in art this year. One gallery I cannot fault for its dedication to presenting new media is Pace, though the dedication is mostly to high production value spectacle (yup, I’m talking about you teamLAB). 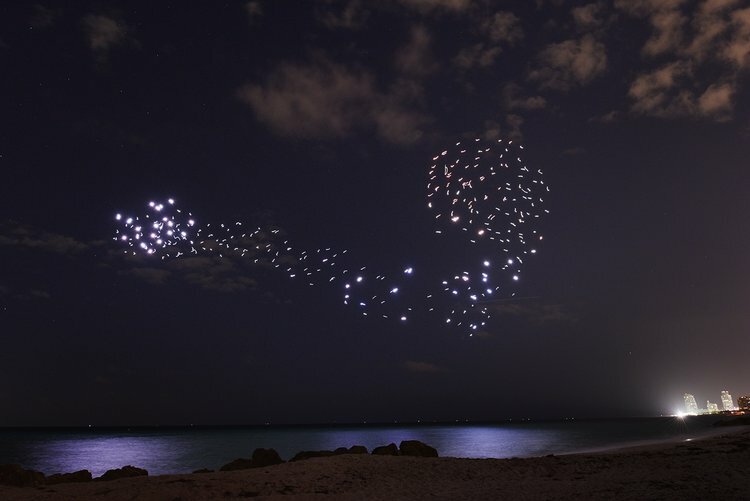 I’m grateful to Pace (and yes, BMW) for one of my best events of the week: Studio Drift’s hundreds of mini-drones mimicking flocking behavior over the beach on Wednesday night, titled FRANCHISE FREEDOM. I can vaguely imagine the technical mastery required to pull this off, but what made the event for me was its moment of imperfection. About a quarter of the way into the flock’s ascent, one drone suffered some minor malfunction and separated from the rest, returning to the landing pad. The drone’s solitary trip was so quiet and stately that hardly anyone noticed. Standing in the press of hundreds, I identified with the little drone, a moment of insecurity and sense of alone-in-the-crowd that I imagine everyone feels at some point during Basel week. As is so often the case in contemporary art, it was the gentle mistake and moment of serendipity that made the experience for me. FRANCHISE FREEDOM by Studio Drift, courtesy of the artists. Miami art week part 1: I just returned from a few days in Miami. We didn’t exhibit this year, both a relief and a sadness. For the prior three years we exhibited at UNTITLED, whose dealers and staff provide a supportive family and an artistic context we’re proud to be part of. Getting into UNTITLED in our first year of existence was a gift and I have always been grateful to Omar, Jeff and the team for taking a chance on us. But with three fairs facing us in February-March, I’m also happy to have been a visitor rather than worker bee this week. Last year’s fairs were odd for everyone: Zika, Trump, an overarching aura of dread. Many longtime adherents didn’t show up, those who did seemed to be waiting for a signal that they should flee. This year felt normal, or more specifically normalized, like a quotation of all the past Art Basel weeks rolled into one. It was probably no more disengaged from what’s happening in the world than in the past, which is to say mostly disengaged. Representation of artists who are not white men has increased greatly, but this feels like catch-up more than advancement. All in all, the week is the Schrödinger’s Cat of art world/market events: if we don't self-examine too closely, it's not dead. But it's not exactly alive either. A few changes around the edges get a lot of attention because they give us something new to talk about a reason to deem a particular year’s fair to be “strong” or not. At Art Basel (the actual fair, not the whole shebang) I generally spend my time in Positions, Nova and Survey sections because those are the edges of the fair (literally), and in them I find the most change and stimulation. I did again this year, with Harold Mendez at Patron, Yuri Pattison at mothers tankstation, Leticia Parents at Galeria Jacqueline Martins.